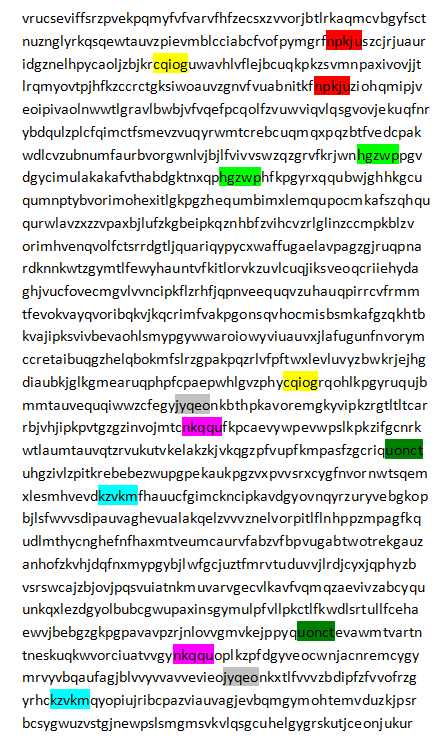 When cracking text-based codes, a first step is often to look for repeated strings of characters resulting from structure in the underlying cypher-text. This can give a way in to cracking the code. Steve dismisses this as coincidence, saying "I would guess that these repeated 5-letter sequences are consistent with randomly generated text based on these frequencies of letters". Alison is not convinced and thinks that this structure of 5 letter sequences would not likely occur randomly for these frequencies of letters. Challenge: Crack the code, regardless of who is right! Algorithms. Experimental probability. Programming. Probability distributions, expectation and variance. Interactivities. Combinatorics. Theoretical probability. Biology. Probability. Codes and cryptography.